'Adrift' In Time And Water, Lovers Battle To Find A Course Adrift, starring Sam Claflin and Shailene Woodley, could have been a generic disaster film, if not for some clever editing that helps pull together its themes. In Adrift, two free-spirited lovers (Sam Claflin, Shailene Woodley) take an ambitious sailing trip...that's complicated by the arrival of a hurricane. To date, the Icelandic director Baltasar Kormákur has made one film about a fisherman who survived in freezing water after his boat capsized off the Ireland coast (The Deep), another about a blizzard that wiped eight climbers off the summit of Mount Everest in 1996 (Everest), and now one more about a hurricane that pummeled a yacht in the middle of the Pacific Ocean, leaving its sailors wounded and badly off-course. Kormákur is a disaster artist, the type of a filmmaker who likes to take his camera outside and witness resilient humans doing battle against the indomitable forces of nature. He even sports the nice, bushy beard of a true outdoorsman. Yet Adrift, his new film, succeeds because it's foremost a romance, even when the desperate necessities of survival command most of its attention. Based on the true story of Tami Oldham and Richard Sharp, two sailors who took their fateful ocean journey together in 1983, the film includes their courtship in Tahiti and their adventures at sea, but makes the crucial decision to interweave the two timelines, rather than follow a straight chronology. So what might have been a typical disaster movie about perfunctorily established characters heading into peril together—like, say, Kormákur's Everest—instead becomes a love story that keeps asserting and reinforcing itself as the film goes along. It's elegant in the cutting. In order for Adrift to work as conceived, the chemistry between the stars is crucial, and Shailene Woodley and Sam Claflin, as Tami and Richard, sell the efficient sketchwork of the scripting. We have to believe that Richard could say a line like "I crossed half the world to find you" and not find it tacky or unbelievable, given their brief, whirlwind affair before hitting the water. Pieces of their backstories help sell their partnership: Both grew up with the sort of complicated family lives that had them gasping for fresh oxygen, and both share a devil-may-care sense of adventure. Their actions are physical and instinctual, and they develop an intimacy that's so much easier than dating rituals of fussbuckets confined to dry land. As Tami and Richard figure out their next step, an elderly couple (Jeffrey Thomas and Elizabeth Hawthorne) approach Richard, the more seasoned sailor the two, with an offer: For $10,000 and two first-class tickets back to the island, would he be willing to dock their beautifully appointed yacht in San Diego? The money would be enough to fund Tami and Richard's frugal seafaring for a year, and even if it weren't, the opportunity to take this journey together has its own priceless appeals. So off they head across the Pacific until they run smack into Hurricane Raymond, which shreds the boat, knocks Tami unconscious, and leaves Richard with injuries so severe that he's entirely incapacitated. He can give guidance and support to Tami, but otherwise he's dead weight. The ingenious structure of Adrift has one timeline chasing the other without ever catching up. The opening sequence finds Tami scrambling to find Richard and get her bearings after waking in a flooded cabin, then the film flashes back to her time working the docks in Tahiti, when she first trades come-hither glances with him. The earlier timeline takes a while to catch up to the point where the hurricane strikes, and the later one details a near-impossible to plan to drift toward the narrow target of Hawaii before the scant supplies of food and water run out. Scenes of the happy couple flirting at the market and doing their best From Here to Eternity on the shore are intercut with dangerous dives to free a jammed rudder and the rationing of canned sardines. Yet past and present rhyme beautifully with each other, to where gestures of affection and acts of resilience become one and the same, like the shorthand that develops between lovers. Kormákur can't outdo the minimalism of All is Lost, which devoted itself purely to the quiet fight against mounting catastrophe, so he opts for a large-scale swooner with cinematography by three-time Oscar-winner Robert Richardson and emotions that suit the panorama. 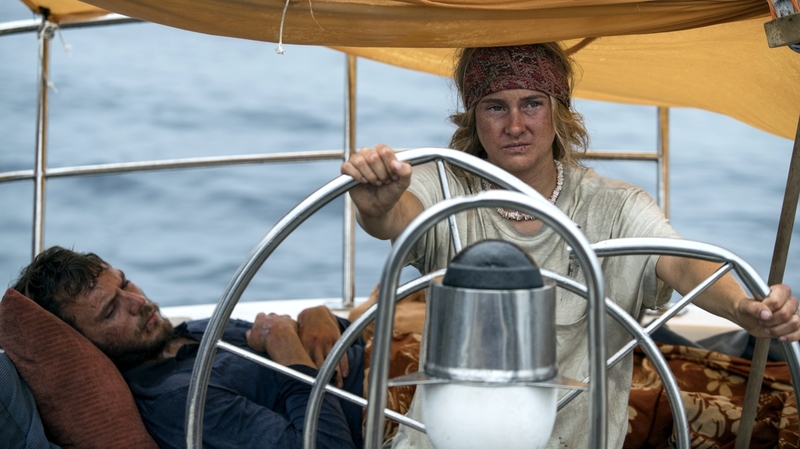 There's a likelihood that Adrift would have been merely generic had it been sequenced more conventionally, but the effect of Tami and Richard communicating across an ocean of time gives the film a lift. The title has a double meaning, describing both their windswept amble through the Pacific and a shared philosophy of going wherever life takes them. If death is beyond the horizon, they're inclined to accept it and keep sailing off into the sunset.